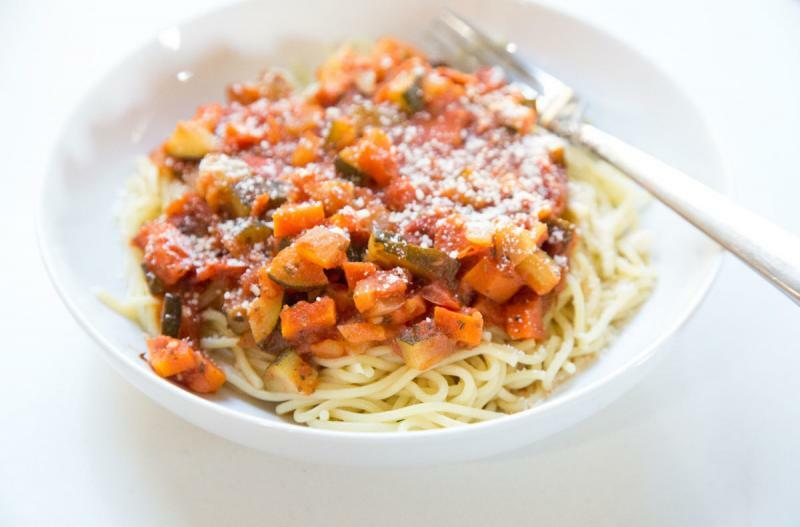 A veggie packed ragu sauce to go with your favorite pasta! To freeze this, you’re going to chop up all the veggies and mix with the crushed tomatoes and seasoning. Then saute to mingle the flavors and serve with cooked pasta and a side salad. Enjoy! Chop the zucchini into small bite-size pieces. Chop the small white onion. Peel and cut the carrots into bite-size pieces. Open and drain the can of crushed tomatoes. Cook the penne pasta, as directed. Drain well. In a large skillet or saucepan, heat the olive oil and saute the zucchini, chopped onion, chopped carrots, and minced garlic for 3 to 5 minutes. Reduce heat to medium low, pour in the crushed tomatoes, Italian seasoning and sugar. Let simmer over medium low heat for about 10 minutes, stirring often, to allow flavors to mingle and marry. Season with salt and pepper to taste. Once the sauce is cooked through, toss with the cooked and drained pasta. Garnish with grated Parmesan cheese, if desired. Serve Vegetable Ragu with spaghetti and side salad. Chop 2 small zucchini into small bite-size pieces. Peel 4 whole carrots and cut into bite-size pieces. Open and drain 2 cans of crushed tomatoes. Put baggie in the freezer and freeze up to 6 months in fridge freezer or 12 months in a deep freezer. Thaw in the fridge overnight, or a warm bowl of water for about 20 minutes, before transferring all of the contents of the baggie into large saucepan or Dutch oven. Bring to bubbling and cook for 20 minutes, then tossing with the cooked pasta as directed. Recipe is dairy-free when the shredded Parmesan cheese garnish is omitted. Recipe is gluten-free when prepared with gluten-free pasta. Thaw and add contents of baggie to large saucepan or Dutch oven. Bring to bubbling and cook for 20 minutes. Toss with pasta.